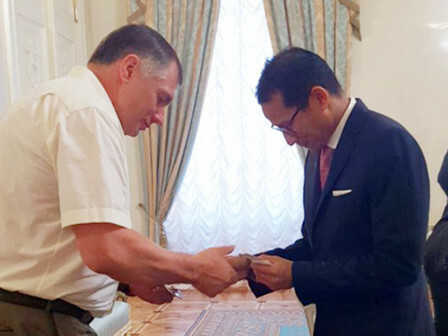 Jakarta Vice Governor, Sandiaga Uno conducts work visit to Moscow, Russia to extend Sister City partnership. In his meeting with Moscow Deputy Mayor, Khusnullin Marat, he conveys his eagerness to strengthen cooperation in sport.
" Moscow becomes a part of success World Cup event in Russia"
He stated, Jakarta can learn from Moscow's success in holding The World Cup 2018 event since in the near future Jakarta will be a host of Asian Games XVIII. "Moscow becomes a part of success World Cup event in Russia. Moscow has Luzhniki Stadium while Jakarta has Gelora Bung Karno Stadium," he conveyed at Moscow Government office, Wednesday (8/1). According to him, cooperation in sport could be realized by sending Jakarta athletes to train in Moscow Gym. "We will also invite Spartak Moscow FC to have a friendship match with Persija in GBK Stadium, Jakarta," he added. Meanwhile, Moscow Deputy Mayor, Khusnullin Marat stated, international sport event will boost up Moscow's economic growth. "I wish Indonesia, particularly Jakarta, is ready to succeed Asian Games event like our successful effort in holding The World Cup 2018," he mentioned.